The pickup: I came home from a week away to find the both the fridge’s crisper and the kitchen counter full to overflowing with produce from our CSA. Apparently somebody wasn’t keeping up on his produce consumption. There were pounds of green beans, basketsful of tomatillos, peppers both hot and sweet, a glut of tomatoes, and two net bags full of a fruit I originally took for mini-tomatillos. 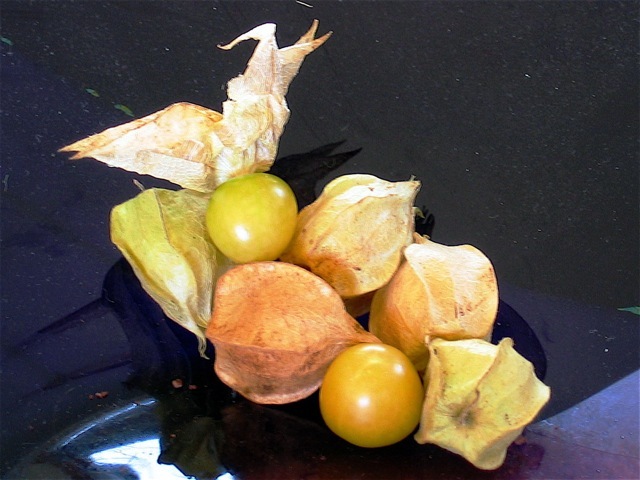 Turns out they're actually a super-sweet tomato called ground cherries. The results: Time to make like a squirrel and store some food for winter. The green beans were easy: A quick dip in boiling water, an ice bath, and into the freezer on trays they went, to be gathered into freezer bags after they were fully frozen. The tomatilllos went into a dry cast-iron skillet with a couple of peppers, some onion, and a couple of cloves of garlic. When they were fragrant and adorned with a few spots of black, they took a spin in the food processor. I froze a huge batch of the resulting green salsa and will add fresh cilantro after defrosting. Then the food-processor bowl got a quick rinse and in went two baking trays of tomatoes that had been roasted at 250 degrees for several hours, concentrating their flavors. (I cut the tomatoes in half and placed them cut-side up on the trays, sprinkled them with olive oil and salt, and scattered a few cloves of garlic on each tray.) These smoky, lush tomatoes are great with pasta or just on bread. Finally, the peppers got a trip to the grill to get blackened all over. Then they were peeled, seeded, and cut into strips for freezing. And those ground cherries? They're still on my counter, but a little Web research turned up a variety of recipes for a simple pie consisting of the cherries, a sprinkle of flour, and some brown sugar. Who am I to argue?